Over the past few weeks Gogo has received “a number of strategic inquiries from financial and strategic acquirers,” that it is currently evaluating, according to CEO Oakleigh Thorne said. WASHINGTON — Gogo, an inflight connectivity provider leasing capacity on dozens of satellites, bulldozed its old business plan July 13 amid looming concerns over unprofitability, encroaching debt deadlines, and a potential buyout. Gogo expects to cut its losses by laying off staff and ending generous airline equipment subsidies while exploring strategic options that could result in splitting the company. Oakleigh Thorne, Gogo’s president and CEO, said multiple parties have asked about transactions that could entail separating the Chicago-based company successful business aviation division from its troubled commercial aviation division. Gogo is eliminating “approximately 55 positions” with intentions to eliminate around 30 percent of personnel by 2020, Thorne said during a July 13 call with analysts. The initial layoffs amount to more than five percent of Gogo’s commercial aviation, he said. Over the past few weeks Gogo has received “a number of strategic inquiries from financial and strategic acquirers,” and is considering those options, Thorne said. Thorne said the difference between what Wall Street thinks Gogo is worth, and what potential suitors might be willing to pay, “is as striking as I’ve ever seen,” but didn’t go into specifics. Gogo’s stock closed at $4.82 a share the day before the announcement, a fraction of its 52-week high of $14.76 a share. Thorne said the company will continue pursuing its revised business goals even as it considers strategic options. Those goals include breaking even on free cash flow, cutting non-satellite spending for commercial aviation by 20 percent, and shaving $200 million in total cash burn, all by the end of 2020. To reach those goals, Thorne said Gogo will curb hardware install-subsidies for customer aircraft. Gogo has outfitted 809 aircraft with its 2Ku hardware, but ran into performance issues that delayed rollout. Thorne said some of the antennas, supplied by ThinKom of Hawthorne, California, were defective, causing icing issues in winter and subpar service uptime. 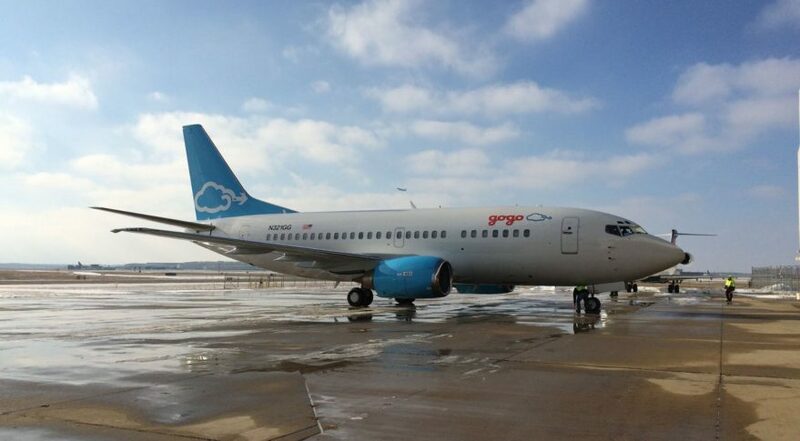 Gogo has fixed most of those problems with software upgrades and hardware replacements, boosting the antenna’s reliability from 84 percent this winter to 97 percent as of May, he said. Gogo will also start charging customers for engineering and certification services it has provided for free, “but which airlines are used to paying for with other vendors for other types of avionics equipment,” Thorne said. Another change is that Gogo will take on fewer one-off customized inflight connectivity projects, and has already shrunk the total from around 500 at the beginning of the year to 91 presently, he said. Satellite capacity is Gogo’s “single largest cost category,” according to Barry Rowan, Gogo’s chief financial officer. It is also an area where cost can’t be controlled, Thorne said. Gogo executives said they are confident current downward trends in capacity pricing will continue, saving the company money even as satcom needs continue to rise. Rowan said Gogo makes “about a 45 percent margin” on revenue from satellite capacity, and expects that to continue. “Revenue is going up as fast as the cost,” he said. Gogo leases large amounts of capacity from Intelsat and SES, the world’s two largest geostationary satellite operators, as well as from several other satellite operators. The company relies on Ku-band capacity, which is the same type that low-Earth-orbit startup OneWeb plans to offer with its constellation. Thorne said Gogo, whose Thinkom-supplied 2Ku commercial aviation antennas are already designed for OneWeb compatibility, is well positioned to take advantage of capacity from multiple orbits. Along with satellites, Gogo uses a system of towers for an air-to-ground, or ATG, network to beam broadband to aircraft as they fly over the continental United States. Thorne said Gogo, which has become increasingly reliant on satellite capacity, is reconsidering whether it will continue with an upgrade of that ATG network. Gogo’s ATG upgrade hit a roadblock in April when the U.S. Commerce Department imposed a trade ban on Gogo antenna supplier ZTE, a Chinese telecom company that violated U.S. sanctions by selling equipment to Iran and North Korea. The nearly three-month trade ban, however, was lifted by the Commerce Department July 13, just hours after Gogo’s investor call. Gogo has slightly over $1 billion in debt, with $362 million due in March 2020. Rowan said Gogo is committed to “addressing these maturities” before they become current this coming March. “We believe the combination of the support of our current shareholder base and a wide array of financing and strategic options will enable us to address our balance sheet,” he said. Thorne and related affiliates control about 30 percent of Gogo’s outstanding shares, and have indicated a willingness to buy more, Rowan said.